This entry was posted in Uncategorized and tagged Etiquette, Infertility, IVF, Single Mother By Choice. Bookmark the permalink. I love this! I wish I could show this to everyone! Great post. Thank you for taking the time to put this together (with help from our friends at Resolve). This journey challenges us to our very core. 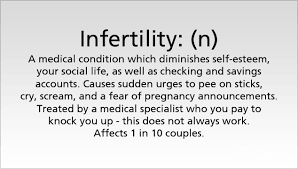 I am amazed that almost every time I speak out in a group about my loss history or experience with fertility treatments, another woman will quietly come forward and share that she has suffered with infertility, too. Sometimes we want to be quiet and turn our thoughts inward but raising our voices we find just how many others are suffering alongside us. We need not suffer in silence and your post thoughtfully reminds others to exercise compassion and courtesy even if – luckily for them – they cannot relate personally.